The Orion IP SLA monitor will show you what’s happening between your computers and the routers on your network. Download this utility and discover bottlenecks, check round-trip times, and set alerts when traffic suddenly increases. Guy’s review of Orion IP SLA Manager. 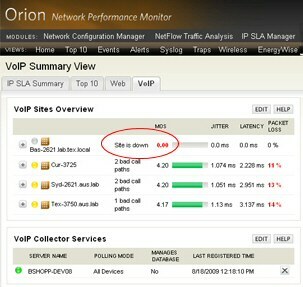 Orion IP SLA Manager evolved from the Orion VoIP Monitor. Its purpose is to identify network performance problems, whether they be site-specific or WAN-related. The key to troubleshooting this type of problem is to look from the perspective of the remote site. This review of Orion IP SLA Manager will help you identify the routes on your network and analyze the performance of each device thus eliminating guesswork. 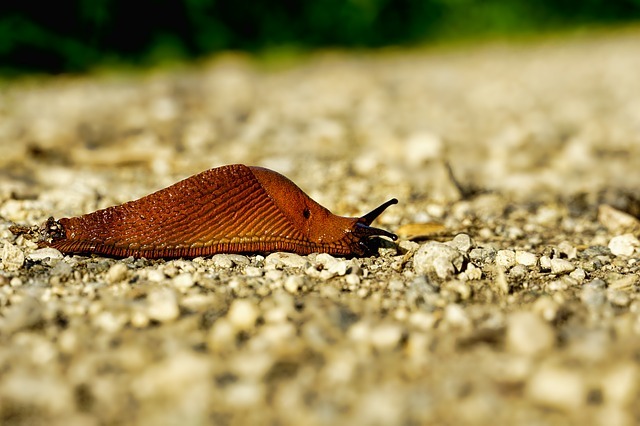 Monitor Cisco VoIP performance statistics. Analyze the traffic for MOS, VoIP jitter, network latency, and packet loss. See more on VNQM. Leverage WAN performance using IP SLA technology that’s already built into your Cisco routers. 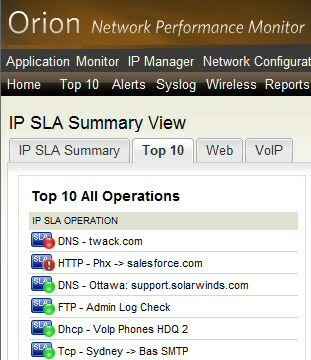 View WAN performance at-a-glance with the Top 10 IP SLA dashboard. Guy’s favorite is to display site-to-site network performance on a clickable, drill-down map. SolarWinds Orion IP SLA Manager offers so much more than just discovering network bottlenecks, the real joy is learning about router traffic. In the present era we accept that learning will be for life, yet sometimes it’s hard, and expensive, to get started. Enter the Orion IP SLA Manager SLA Monitor which will kick start your training by measuring key operations on your network. Listening-in to the traffic on your network is rather like the government, or a phone company tapping into your conversations. In both instances, the frequency, latency and bottlenecks are more interesting to a techie than mundane content of the traffic. This SolarWinds tool will help you troubleshoot network bottlenecks or computer to computer latency. Orion IP SLA Manager works by piggy-backing a ride on existing router messages. The skill of any such monitor is analyzing and displaying the data. The fun of learning with Orion IP SLA Manager is selecting the data most relevant to your network, for example, ping echo, DNS resolution times, or HTTP statistics. The result of a few hours of work / play is that you set alerts on key indicators and then get on with the rest of your job. When you get flagged with an alert you put your skills into practice and isolate the network problem. When you don’t get flagged you revisit the tool to check that the thresholds are realistic. The ability to monitor network traffic all starts with NetFlow. This is a UDP protocol that transmits reports about router activity. The central component is the Cisco Network Services (CNS) with its NetFlow collection engine (NFC). A key development is active monitoring, which generates network traffic in a continuous, reliable, and predictable manner, the result is that you can take the pulse of your network’s performance and health. 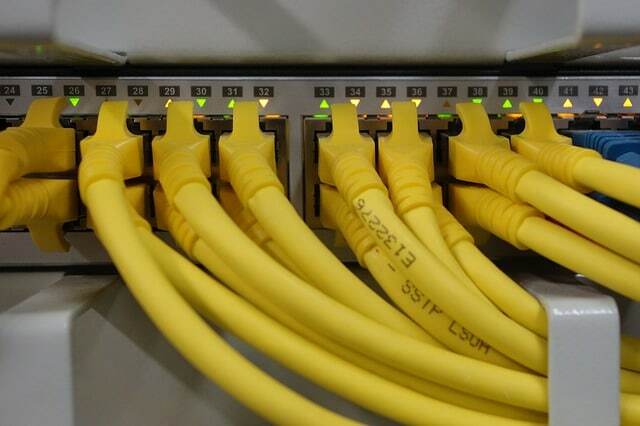 As a result	Cisco IP SLA turns the router into a network probe. At the heart is a network management system (NMS). The mission of an NMS is to discover network devices such as routers. It then mercilessly tests them for availability and performance. Where it helps a network administrator is that an NMS such as the Orion IP SLA Monitor stores the results in a database which we can then query for all manner of reports. The Orion IP SLA Monitor uses tried and trusted technologies to poll the devices. NetFlow is probably the most efficient method, but it also collects data using SNMP traps, WMI polling or even good old ping (ICMP Echo). One feature of all Orion reporting is mapping showing not only links but geographical relationships between data centers. SolarWinds Orion IP SLA Manager offers so much more than just discovering network bottlenecks, the real joy is learning about router traffic. See how effortlessly this monitor analyzes and displays VoIP jitter, network latency, and packet loss. 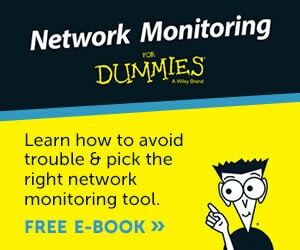 The key to configuring this Monitor is selecting the data most relevant to your network, for example, ping echo, DNS resolution times, or HTTP statistics. As a result of a few hours of investigation is that you can set alerts on key indicators, then get on with the rest of your job.